What is Solar Screen Fabric? Solar Screen is a special window screen mesh that is specially designed for Sun Control. 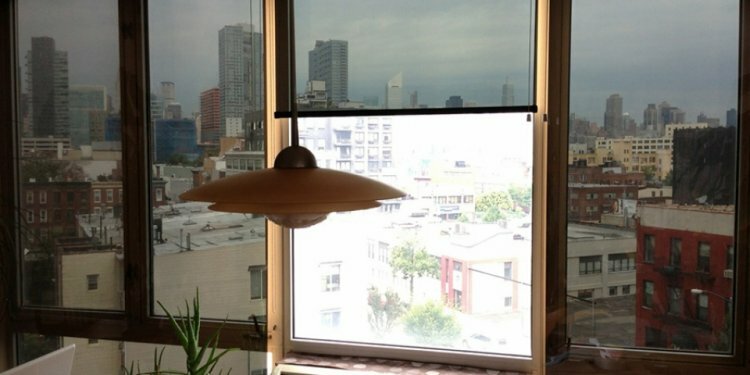 It is the most effective way to Control the Sun's Heat and Glare by stopping it before it enters your window. Much like a big shade tree, exterior solar screen will help reduce your cooling costs, can reduce the load on your air conditioning and will help reduce glare and fading of home furnishings. Advanced solar screen fabric is extremely durable and pet resistant. We only sell material manufactured by Twitchell™ Corp.
Reduce Cooling Energy Costs. Independent Studies have shown that solar screen installed on exposed windows can reduce the cooling portion of electric energy costs as much as 30-35% on a typical home in a warm climate. In many cases the 'payback' period can be as short as 1-2 years. Daytime Privacy. With solar screen on your windows, it is very hard, if not impossible for people to see into your home during the daylight hours. Much like dark sunglasses, even though people can't see in, outward visibility can be excellent, especially with the darker color (black, brown or dark bronze) Textilene® 80 Solar Screen. How Does Solar Screen Do All That? Solar Screen Material cools and protects by reducing heat and UV rays in 3 ways. They Block the sun's hear and UV rays, Absorb the heat and Dissipates it with the airflow through the screen. The Textilene® 80 Solar Screen Chart illustrates how the heat entering the home is reduced by a very substantial amount.